When Do the Brooklyn Cherry Trees Blossom? You'll never know what weather you'll get during a Brooklyn spring. Natives have sandals and snow boots on the ready for the eclectic weather in March and April. Yet every spring, despite the mix of frigid and warm temperature, like clockwork, the cherry blossoms welcome us out of a cold winter and are signs that another spring has arrived. Cherry Blossoms are the most colorful and breathtaking sight, but sadly, like many aspects of nature, its beauty is short lived. If you have a trip planned to New York City in the spring and are looking for blossoming cherry trees, here are the best spots to find them in Brooklyn. 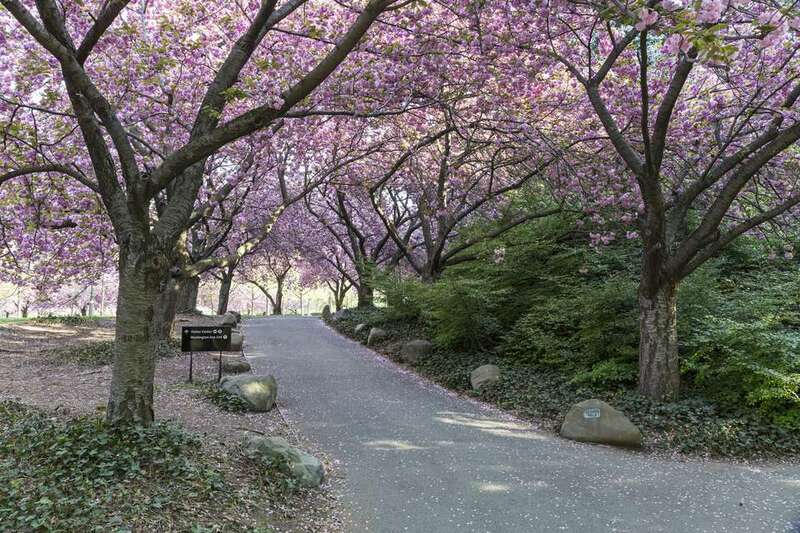 Visitors can enjoy watching flowering cherry trees in Brooklyn's parks and neighborhoods, but especially at the famous Brooklyn Botanic Garden. But when exactly is cherry blossom season, and when do the cherry trees actually flower? Cherry blossom season in Brooklyn, NY, runs from mid-March to late April. In fact, different varieties of cherry trees blossom at different times in the spring. Weeping cherry trees bloom before the double-blossom cherry trees. So, you can enjoy cherry blossom season over a period of weeks, and see different trees bloom in the course of the month. A popular weekend-long Cherry Blossom Festival, which in Japanese is called Sakura Matsuri. The festival is quite popular and has over sixty events including performances "that celebrate traditional and contemporary Japanese culture." If you aren't a fan of crowds, here are some other alternatives. Spend a spring afternoon at Green-Wood Cemetery in Greenwood Heights. Stroll around the serene historic cemetery in late March and you'll spot cherry trees blossoming. According to the New York City Parks Department, you can see cherry trees blossom at Borough Hall, near Joralemon Street, Lenox Street & Cadman Plaza West. This area is located in and around scenic Brooklyn Heights. After you've spotted your sprouting trees, treat yourself to a walk around quaint Brooklyn Heights. This historic section of Brooklyn still has a few cobblestone streets, and is also home to the Brooklyn Heights Promenade, with its stunning views of lower Manhattan. If you don't want to shell out the cash for the Brooklyn Botanic Garden (a tip-its free on Tuesdays), head to neighboring Prospect Park, where you can see cherry trees blossom in April. If the weather permits, pack a lunch and start your picnic season on the lawn in this beloved Brooklyn park. Cherry blossom fans who happen to be runners should pack their running shoes and partake in the Prospect Park Track Club's Cherry Tree 10-Miler. Although the race does take place in February, slightly before Cherry Blossom season officially begins, it's a Brooklyn running tradition. If you're in Brooklyn during the spring, be sure to carve out time to stop and see the cherry trees blossom. Don't forget your camera, because you'll want to Instagram these #cherryblossom pics.